Let me begin by debunking a common myth. It’s not necessary to solder a solderless crimp terminal. For more than 70 years, solderless terminals have been used on everything— from automobiles and appliances to warships and commercial and military aircraft (Boeing hasn’t soldered a crimp in over 40 years). Developed in the days leading up to WWII by the aircraft manufacturing industry, they are a tried-and-true system for making low-resistance, solder-free electrical connections. An example of a poor connection. Among other problems, the ring terminal is oversized, compromising its conductivity. 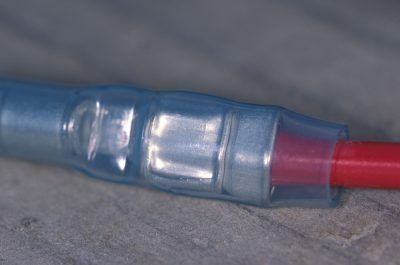 The wire strands are also too long, extending well past the terminal barrel. The most reliable terminals rely on a brazed, seamless barrel using annealed, tinned copper, which resists bursting regardless of where it is compressed. Annealing ensures the terminal is malleable rather than brittle, and tinning reduces the potential for corrosion. Inside the barrel, serrations or grooves cut into and grab hold of the wire as the crimp is made. This forms a good mechanical and electrical bond. There are three types of insulation for small (10-22 AWG) solderless connectors: PVC, nylon, and heat shrink. More brittle PVC tends to crack if overcrimped. This can lead to a short or crossed circuit. Nylon is much more durable; it is very difficult to pierce or remove. It is distinguishable from the PVC by its translucent color (although it utilizes the same red, blue, and yellow color coding). Heat shrink insulation is similar in appearance to nylon except it is somewhat suppler. Exercise care and choose crimping tools with gently rounded dies for attaching heat shrink terminals; more aggressive crimping dies may create small holes, which will grow during the heating/shrinking process. Test yours to make sure they do not pierce the insulation. While not necessary in every application, heat shrink terminals prove their worth in extreme vibration and wet environments. 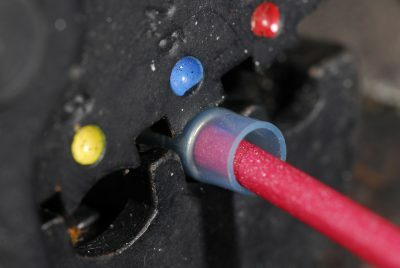 The mouth of the barrel should be tapered or funnel-shaped so that the wire strands are less likely to peel back as the connector is placed over them. This funnel also serves as a strain relief device, which is useful for mitigating the effects of movement and vibration. Too often, however, I see this valuable feature unused with the strain relief uncompressed. Ratcheting tools apply pre-set pressure, making them attractive for boat owners and inexperienced apprentices. I, however, like many other professionals, find ratcheting crimpers bulky and awkward, particularly in confined spaces. Most of the boat building facilities I visit use conventional, non-ratcheting crimpers. They can produce good results with some caveats: They should be dedicated crimpers and not combination crimper/strippers. Crimping must take place forward of the pivot point; the die for insulated crimps should be closest to the cutting tip, and the handles must be long enough to impart significant leverage with the overall tool measuring no less than 9.5” (241.3mm). Until a few years ago I eschewed automatic wire strippers. They often broke when stripping cold insulation, or damaged the wire. The latest generation of automatic strippers (see photo, above), however, is light years ahead of these early models; they are rugged, work consistently, and are especially adept at removing the outer jacket from duplex cable. Ensure that the crimping tool is of the proper size and die configuration for the terminal. Strip the wire without damaging any of the strands. The strands should remain straight and uniform. If using a ratcheting tool, place the terminal in the tool. Be sure it is in the proper die station, red, blue or yellow. If using a nonratcheting tool, place the terminal over the wire first, then carry out the crimp. The die should be located slightly back, roughly 1/8” (3.175mm) from the flanged end of the terminal, or centered on the wire compression portion of the terminal barrel. 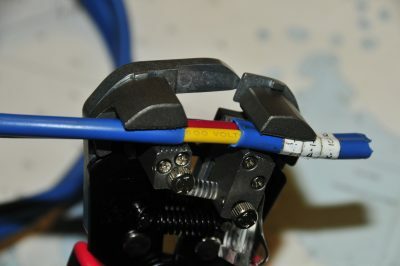 A solderless terminal placed in the crimping tool’s die station. Note the color coding. Insert the wire into the terminal. The conductor should be flush with the flange end of the crimp barrel. Uninsulated wire should not protrude from the end of the conductor, as this will prevent the strain relief sleeve from functioning properly. Execute the crimp. The ratcheting mechanism should travel through a full cycle before the terminal is released (most won’t release otherwise). If using a nonratcheting crimping tool, it’s necessary to apply enough pressure to break down the oxides on the inside of the connector so the serrations can imbed themselves into the wire strands slightly. Proper compression makes this area of the crimp gastight. If air is present then corrosion becomes more likely. Too much compression, on the other hand, will elongate and weaken the wire strands. This will create a mechanically weak connection that may result in high resistance, or a broken conductor. Most ratcheting tools simultaneously crimp the strain relief and conductor sleeves. Most manual crimping tools do not, which means they must be crimped separately. Because it is compressing the wire’s insulation, the strain relief crimp requires less compression than the conductor crimp; don’t overdo it. Release the terminal and inspect. The wire should be held firmly and a slight expansion of the flange end of the barrel should be evident. This “bell mouthing” indicates that the crimp pressure was applied at the proper distance from the end of the barrel. To test the connection, grab the ring terminal end of the terminal, not the barrel, with only your thumb and forefinger. Using moderate force, you should not be able to pull a compressed solderless terminal off the wire. If you can, the terminal is defective or not properly compressed. A properly executed solder-free connection. In order to receive UL or military approval (Mil-T-7928), crimp connectors must meet a variety of specifications, not the least of which is tensile strength (these are detailed in ABYC E-11). For example, a 12-gauge crimp should be able to support 70 lbs for UL approval, and 110 lbs for Milspec approval, which is more than the average adult can exert using his or her fingers. 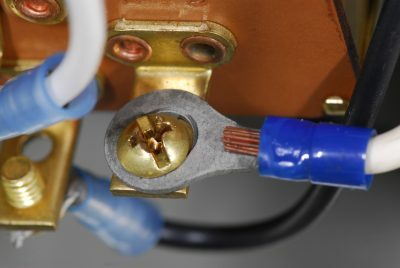 In short, if you use good quality materials, the right tools, and proper technique, you should be able to make low-resistance, reliable, and long-lasting solderless terminal connections. About the Author: For many years a full-service yard manager, Steve now works with boat builders and owners and others in the industry as Steve D’Antonio Marine Consulting. He is an ABYC-certified Master Technician, and sits on that organization’s Engine and Transmission and Hull and Piping Project Technical Committees. He’s also the technical editor of Professional BoatBuilder.